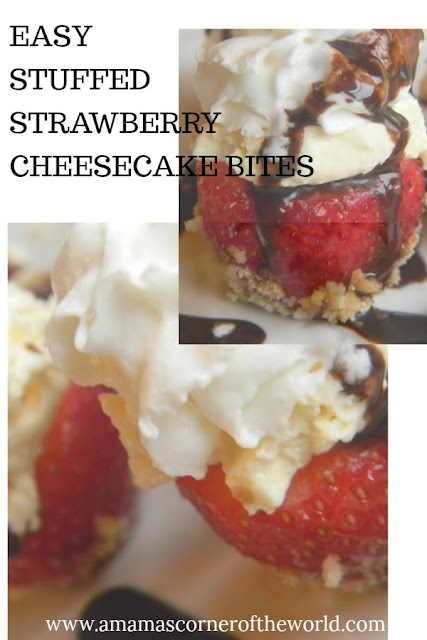 Need a quick, easy and fun Valentine’s Day dessert? 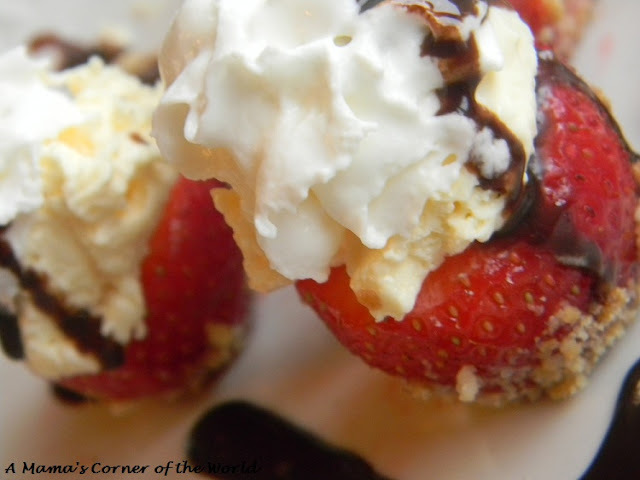 With just a few simple ingredients and about ten minutes, you can serve up these cute little cheesecake stuffed strawberries to end your Valentine’s Day meal. They are bite sized and offer just the right amount of sweetness without overloading the meal with a heavy dessert. Prepare the Strawberries. I like to cut off the pointed tips of the strawberries so that they will sit upright on a serving tray—but that is optional. 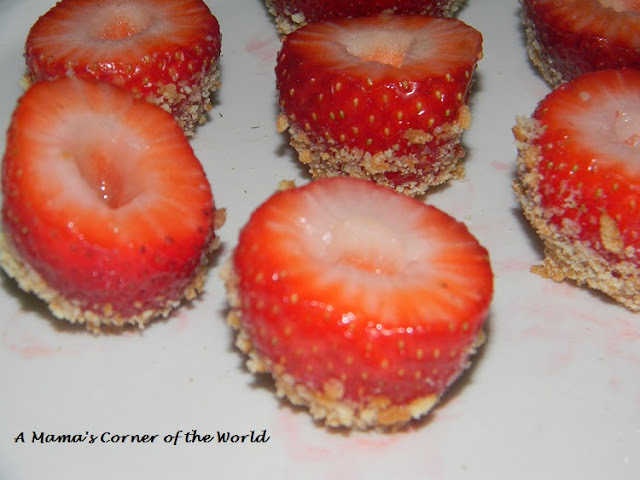 Dip each berry into a little strawberry juice or water and press the bottom third of the berry into the Vanilla Wafer crumbs to create a “crust like” appearance. 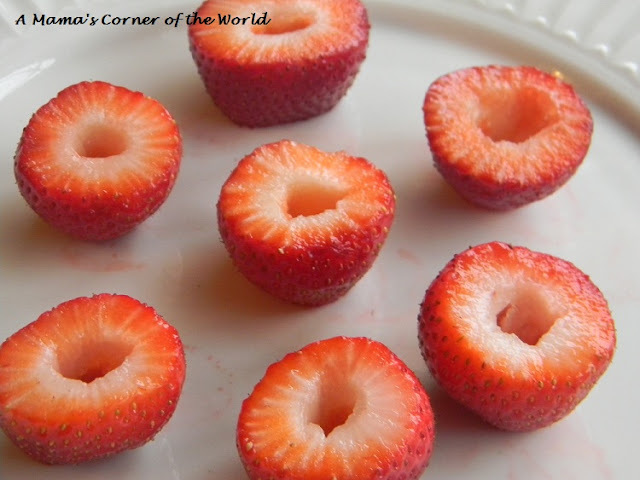 Fill and garnish the strawberries. Either fill each berry with a spoonful of cheesecake filling or pipe it in with a pastry bag. Top with piped-on whipped cream and drizzle with chocolate syrup, if desired. Serve. Serve these stuffed strawberry cheesecake bites immediately or the whipped cream begins to fall. If you would like to make them ahead, simply prepare the berries, stuff with cheesecake and add the whipped cream in the minutes before serving. 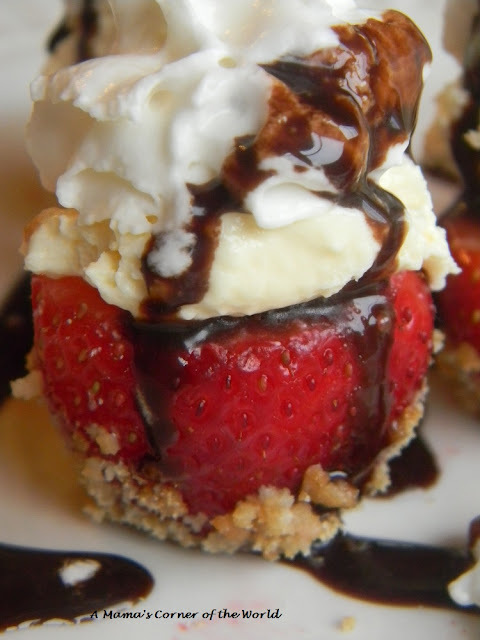 This is my absolute favorite, quick and easy, Valentine’s Day dessert. These let me serve a “fancy” dessert without a lot of fuss and prep-work. As a bonus, the kids like them and have a lot of fun making these for other parties and fun events too. These look fantastic! My family would love them! I'd love if you would link up to Wonderful Food Wednesday this week. Hope you'll come by. Yum! These would taste amazing! These are so yummy looking!! I definitely think I'll be serving these for Valentine's Day. (And where have I been - They sell ready-made cheesecake filling?? I might eat a whole thing before I use it in the strawberries. LOL) Thanks for sharing at Food on Friday.